On Monday morning Media24 Investigations embarked on a unique project to track the mood of the country through the social network. We wrote a computer script to track Twitter for messages relating to the Murray affair. From Monday morning to late on Wednesday we collected some 20 000 tweets. The rate of tweets exploded when Murray’s painting was attacked in the Goodman Gallery in Rosebank, Johannesburg. In analysing our data we divided it into two chapters: tweets before the “defacing” incident when the debate was dominated by free speech versus personal dignity issues, and tweets from after the painting attack when the debate raged over whether this was justified or not. 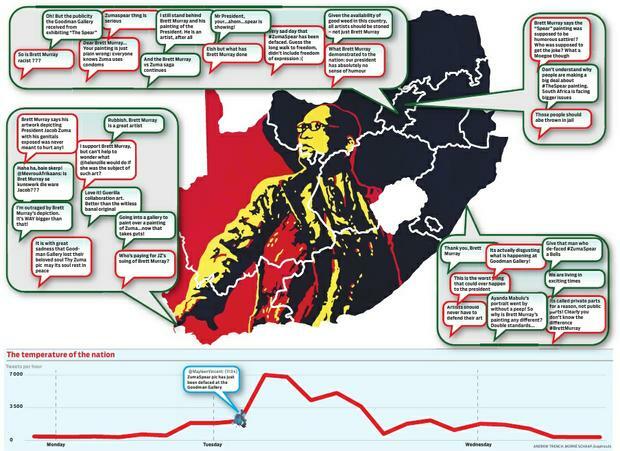 We also tried to see how South Africans in different parts of the country reacted to the outcry. Before the “defacing” incident the ratio of positive tweets to negative tweets was 1.7:1 across our sample to that point. After the defacing incident that gap narrowed, with the ratio of positive to negative tweets closing to 1.3:1. The volume of tweets also rocketed, rising from just under 1700 over most of Monday to more than 7 000 in an hour after the painting was damaged. Our sentiment barometer does not analyse the meaning of the tweet, it simply tries to classify the emotion of it and the shifts in mood were a telling barometre of impact of the drama on users of the online social network.